You can upload your photos or artwork and we can place them on a variety of papers, vinyl or canvas. NOTE: All photos must have a signed copyright release. We can make posters in practically any size from 11″ x 17″ to wall size! We stock a variety of paper types and mounting options to meet all your needs. For a versatile non-reflective presentation and display. Presentation Papers – Best media for producing photo quality output on a cost effective matte paper. Quick, economical posters 17″ wide x however long you need. Most of our customers get from 5-8 feet long. These are made for 1-time use, but if put up carefully, can be reused. These can generally be completed within 1 business day. 24″, 36″ or 44″ wide banners – up to 8′ long. Done on Matte Paper which produces photo quality output on a cost effective matte paper. Great for indoor banners that must remain in place for a short period of time – but may last longer if not disturbed. 36″ wide 10 mil scrim vinyl – for durable signage. Can be used inside or outside. Grommets or pockets as well as hemming are available. While not usually thought of for banners – they make excellent panoramic scenes in 10″, 13″, 16″, 24″ & 36″ wide widths. Grommets can be placed on any of the above projects for an additional charge. These engineering prints and blueprints reproduce architectural and engineering renderings with high definition and contrast. These large size create easy-to-read alternatives for sharing concepts with clients and contractors and is a low-cost option when high volume prints are required. Great for outdoor advertising, elections, advertisement, or pride. Some shapes are available for yard signs. 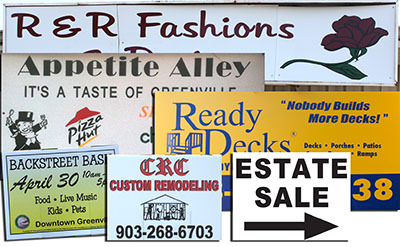 Call us for additional information on our shaped signs.